Yesterday, my dad said, “I never met a pork chop I didn’t like.” And then he listed out, Bubba Gump-ily, all sorts of ways to prepare pork chops that he liked. I’ve never agreed with him more. And then he asked me if I had been using my grill. The one that he bought me. And I had NOT. And I felt GUILTY. So I decided that I should. And I should make a delicious, delicious pork chop. And then I talked to my mom because I bought an acorn squash and I didn’t know how to cook it. Dad said, “I don’t know how to cook that, you have to talk to the cooker. Me: Hey cooker. How do I cook this? Mom: Cook it in the oven in a pan. And then put some water in the oven. Me: Put water in the pan? Or put water in another pan in the oven? Mom: No, put water in the pan with the squash. Me: The water is touching the squash? Mom: Yes. You kind of steam them and then put butter and brown sugar on them. 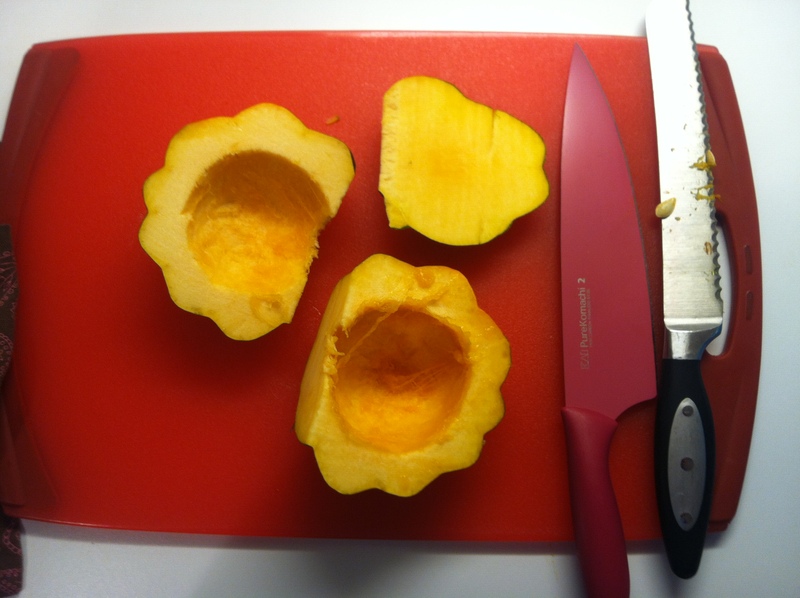 Me: How do you cut the squash? Like a hot dog or a hamburger? Mom: Oh, that’s so cute I’ve never heard that before. Me: Oh, ok. So, do you know what I’m talking about then? After a few more minutes of this, I just decided I’d just roast it and try the steaming method another time. Maybe when I go home for Thanksgiving. And we can confuse each other in person. I didn’t know what to do for the pork chop. I didn’t even HAVE a pork chop. Good planning, Bethany! 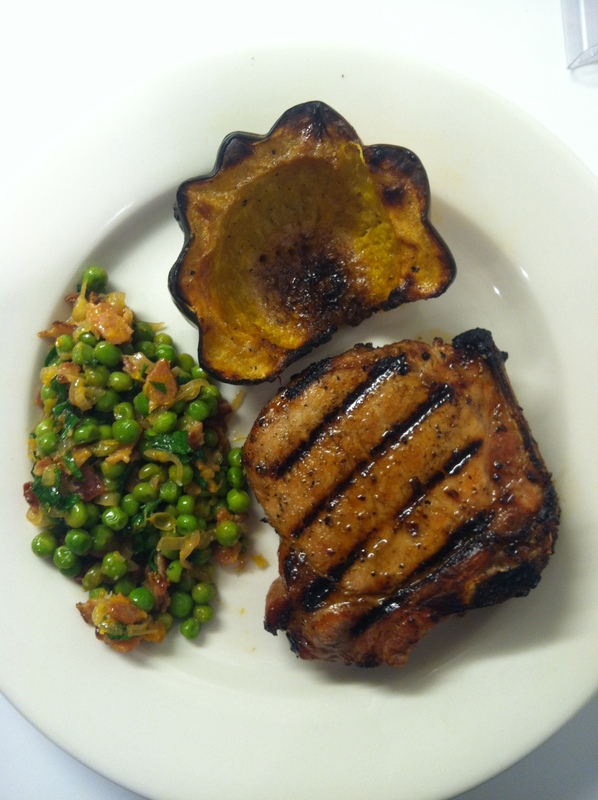 So I looked up and found a Sunny Anderson’s Easy Grilled Pork Chop Recipe. Easiness baked right into the name. 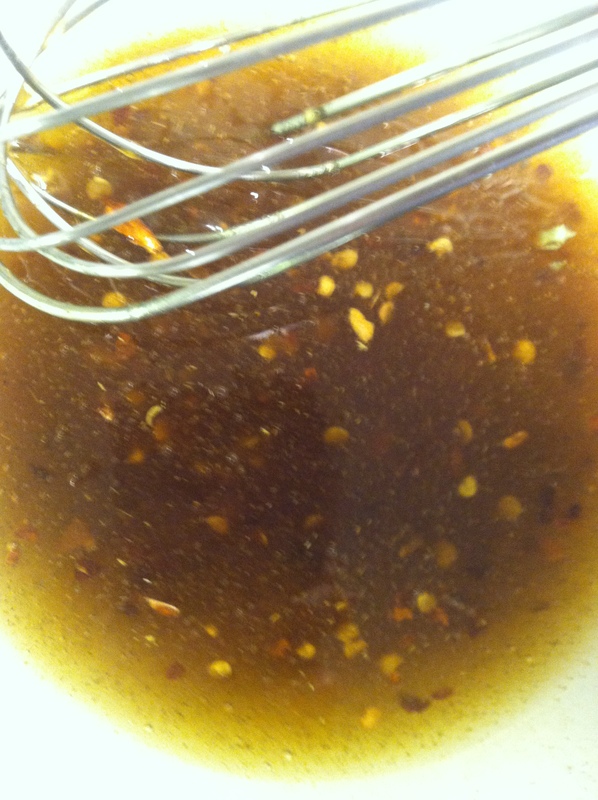 I already had most everything for the marinade at home, too. Boom. During my recovery from the previous night’s going away party, I watched Symon’s Suppers on Cooking Channel. And he did a straight up ode to pork episode. (I think I’m in love…) As a kid, he hated peas until his mom loaded them up with bacon. Cause bacon makes everything better. So, Michael Symon’s Peas and Bacon. 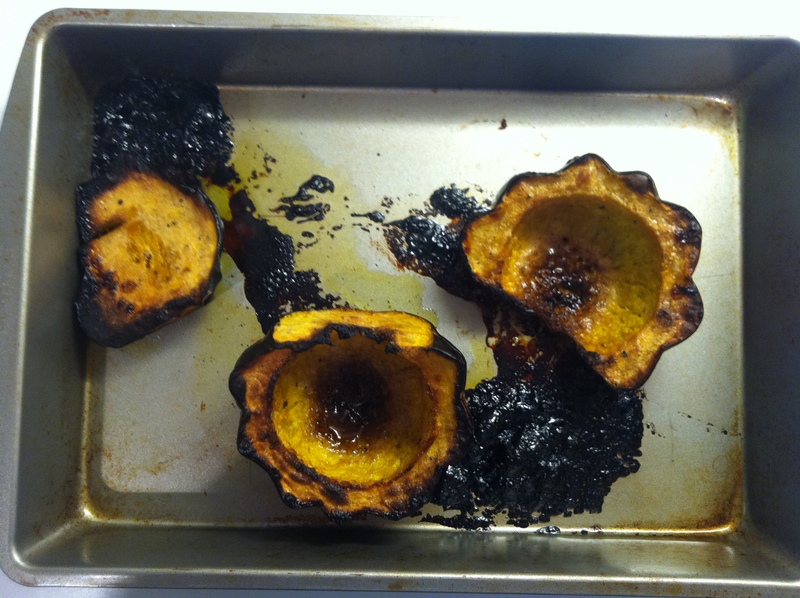 And lastly, simple roasted acorn squash from the Queen of Butter Southern Cuisine herself, Paula Deen. Three recipes to follow, all pretty easy. I didn’t really even screw them up! Except that I ate dinner at 9:30. Which is when the Spaniards eat it so I was being INTERNATIONAL. Sure! That makes sense! Yeah, the recipe called for 8 pork chops. But since I was just cooking for little ole me, I only cooked two. (One for now and one for later.) And they were about an inch thick. But I used the same amount of marinade. Cause, I roll hard like that. 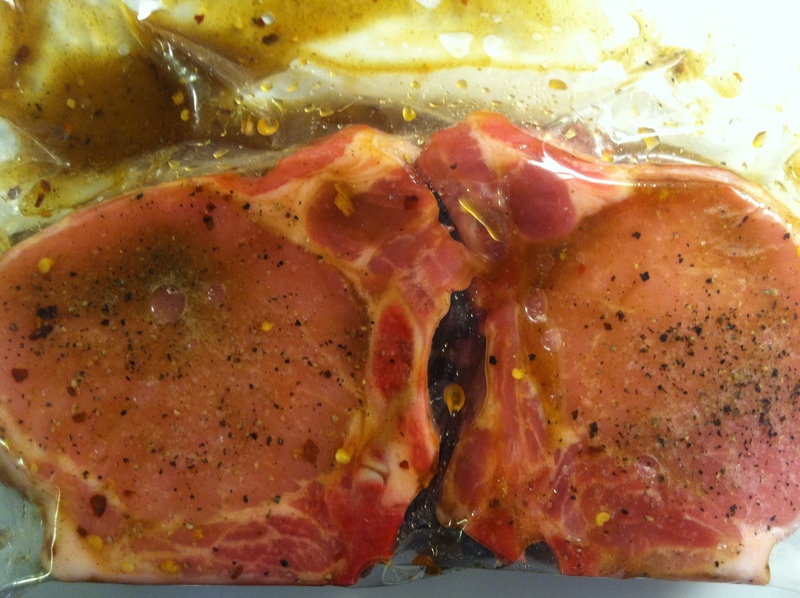 Sprinkle both sides of the pork chops with salt and pepper and place in a resealable plastic bag with the marinade. Let rest on the counter for 1 hour. Heat a grill or grill pan over medium heat. Remove the pork chops from the bag and lightly sprinkle with salt and pepper. Place on the grill and cook until the pork chop releases from the grill, about 4 minutes. Flip and cook on the other side for another 3 minutes. If using a grill pan, be sure to do in batches so you don’t steam the chops. Since my chops were thicker than the ones the recipe called for, I did them for 4 minutes on each side, and then flipped it again and left it on the grill for 3 more minutes. If you don’t have a grill or a grill pan, ain’t no thing. You can do them in the pan. Cook the bacon in a large sauté pan over medium-low heat until the fat is rendered and the bacon is crispy, about 5 minutes. Yeah. This took me more like 8 or 9 minutes. Maybe I wasn’t trying hard enough. Maybe I didn’t believe in Santa hard enough. Or maybe it just took me longer. Add the garlic and shallots and sweat for 1 minute. Add the peas and increase the heat to medium. Pour in the orange juice and cook until the peas are tender, about 2 minutes. Remove from the heat and fold in the orange zest, parsley and butter. Taste for seasoning and add salt if necessary, though you shouldn’t need much because the bacon adds a natural saltiness to the dish. I just added a tiny sprinkle of kosher salt. In a small mixing bowl, combine the brown sugar, butter, syrup and salt and pepper, to taste. Rub the squash cavities and cut sides of the squash with the butter mixture and place them on a baking sheet, cut side up. Here’s the finished meal. I’m not gonna lie, it was rull good. It had a very comforting, fall vibe to it. Everything had a touch of sweetness, but it balanced the sweet and savory. I’m coming back to this one again. Maybe I’ll even make it for my pops. Make sure he REALLY likes ALL the pork chops. Well done! 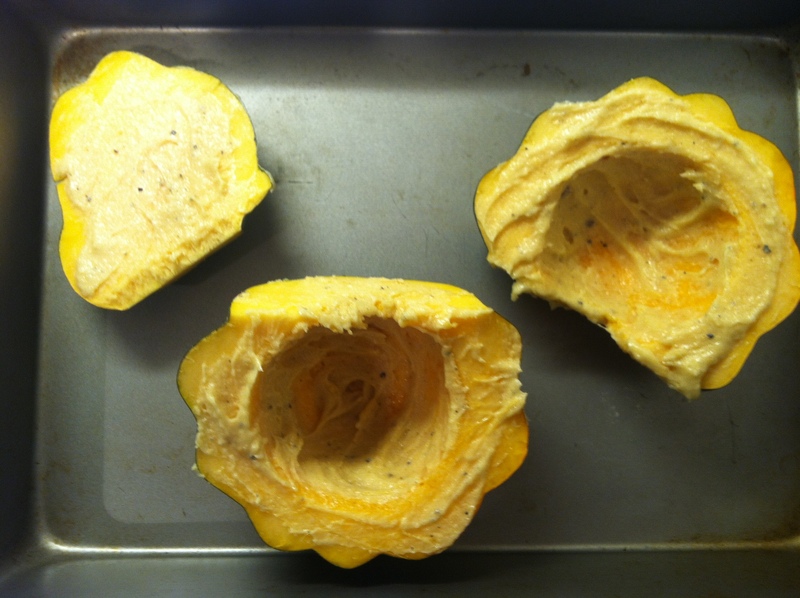 I love acorn squash, I don’t think you needed the maple. Unless you needed maple to concoct the most-bestest fall cocktail ever; Maple-Bacon Bourbon Fizz. Yeah, I went there. It’s called fat-washing. For reals.